[By Dave Holmes] Melbourne, August 5 — A rally outside Melbourne’s State Library protested Turkey’s invasion of northern Syria and its attacks on the Afrin and Shehba regions. Kurdish-majority Afrin is the Westernmost canton of the Democratic Federation of Northern Syria. It is physically separated from the rest of the federation and is thus more vulnerable. Turkey invaded northern Syria precisely to prevent the link-up of Afrin with the other cantons. The rabidly Kurdophobic regime of Turkish dictator Recep Tayyip Erdogan is terrified of the example of a democratic, self-governing, multi-ethnic territory on its southern border. The unprecedented effort being made taken to empower women is another reason why Turkey’s misogynist rulers mortally fear the DFNS. The Turkish military and mercenary gangs under its control are daily attacking Afrin city and the peaceful villages of the canton. They can kill and destroy but all indications are that their brutal attacks will meet a resolute and unyielding resistance from the highly motivated defence forces. Kurds, Arabs and the other peoples of the region are united in demanding that Turkey stop its attacks and get out of Syria. The rally was addressed by Basak Gel from the KDCC, John Tully from AFK, Dima Al-Msodny from Socialist Alliance and Mahmut Kahraman, Australian representative to the Kurdish National Congress. The event was chaired by Karen Fletcher from AFK. 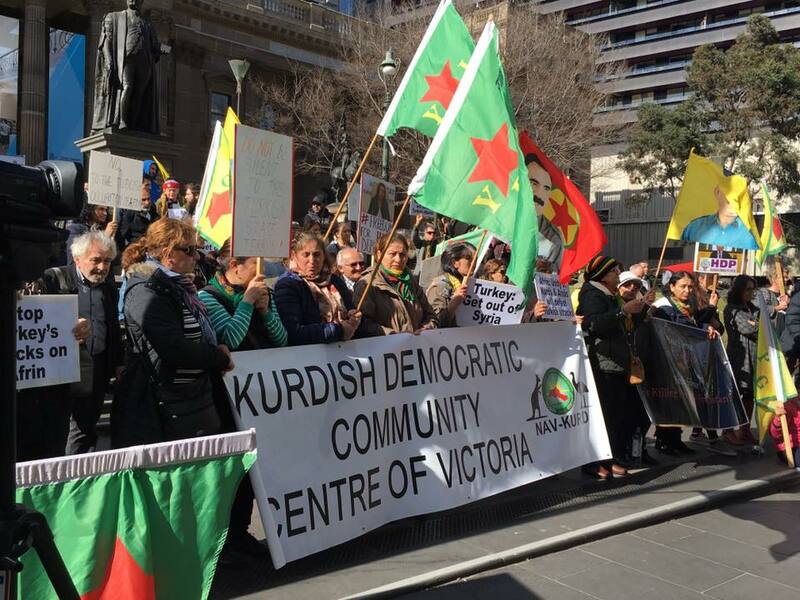 The protest was organised by the Kurdish Democratic Community Centre of Victoria in conjunction with the Australians for Kurdistan solidarity group. This entry was posted in Turkey and tagged Democratic federation of Northern Syria, Rojava, Turkey by AFK. Bookmark the permalink.